Geumgang banya baramilgyeong, or Geumgang-gyeong (Diamond Sutra) in short, is the basic sutra of the Jogye Order in Korea and it is the second most widely read sutra in Korea after the Prajnaparamita Sutra. Sin Ji wrote the sutra, Beopgye drew the pictures and the woodblocks were inscribed by Sin Myeong and Beopgong under the supervision of two government officials, Seol Sadeok and Kim Yeonggi, in the 12th year of King Gongmin's reign (1363). 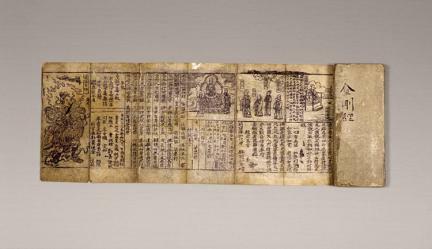 Measuring 27.2 cm in length and 10.8 cm in width, this is a collapsible sutra like a folding screen. 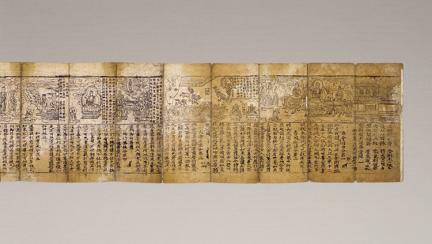 The sutra contains Byeonsangdo, a picture symbolizing all the faces of Buddha, also one of the guardian gods of the Buddhist cannon, and a list of names who of those who participated in the publication of the book. Because it was made in the provinces, the condition of inscription and printing is not good. 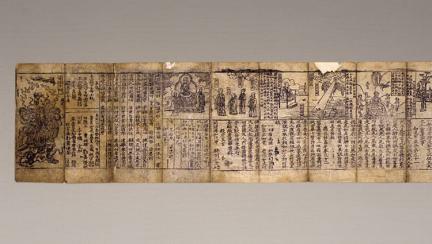 However, it helps understanding the theme of the sutra by adding a picture in each section.